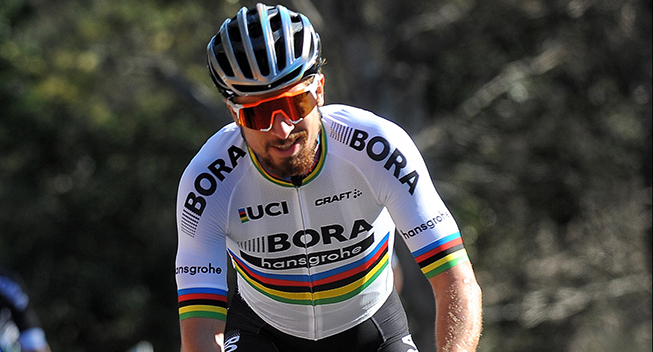 UCI double World Champion Peter Sagan will be supported by a fresh, young team at the 2017 Santos Tour Down Under as BORA – hansgrohe makes its Australian debut. The team landed in Adelaide, South Australia last night and has already hit the streets for a training ride early this morning towards the beach with the rainbow stripes leading the pack. Joining Sagan at the start line will be Australian young gun Jay McCarthy who finished fourth at the 2016 Santos Tour Down Under. (Note: Jay McCarthy is not yet in Adelaide). Race Director Mike Turtur said it was exciting for the race, and spectators, to see the German team in action for the first time. “BORA – hansgrohe will field a really strong line up for the Santos Tour Down Under and have shown that they want to be competitive in their UCI WorldTour debut,” he said. “With the reigning UCI World Champion Peter Sagan leading the team and returning to the TDU for the first time since 2010, it will be a really exciting and close-fought event in 2017. Turtur said it was a great to see McCarthy, 24, have the opportunity to ride alongside Sagan. “Jay really impressed the cycling world at last year’s Santos Tour Down Under, winning the Young Rider classification and Staging Connections Stage 2 from Unley to Stirling. In announcing his return to the Santos Tour Down Under, Sagan said he was looking forward to tough competition and a strong start to the 2017 UCI WorldTour season. “This iconic Australian race brings the world’s best riders on a course that features tough climbs and fast sprints and I’m convinced its 19th edition could be the best so far,” he said. The team BORA – hansgrohe rider roster competing at the 2017 Santos Tour Down Under will be led by sport director Steffen Radochla (Germany) and includes riders Peter Sagan (Slovakia), Sam Bennett (Ireland), Gregor Muhlberger (Austria), Rüdiger Selig (Germany), Michael Kolar (Slovakia), Jay McCarthy (Australia) and Lukas Pöstlberger (Austria).